This page includes archived research summaries of studies released in 2008. This study was designed to investigate why acoustic harassment devices, or pingers, on fishing nets do not always succeed in keeping dolphins away. The researchers did a series of recordings around pingers of several different styles, and found that the received sound levels did not simply increase as they came closer, but fluctuated dramatically; thus, animals approaching the nets may not have clear sense of how far away they are. While the results here are somewhat mixed for pingers (overall, the average sound level DOES go up as the animals approach, albeit mixed with large variations), the study offers a fascinating glimpse into the real-world factors that will often confound simple geometric or spherical-spreading models generally used to predict sound exposure levels around any sound source. The researchers suggest that many factors likely contribute to the variation: changes in directitivty of the source, subtle differences in source level for each ping, and, most influentially, as a result of the constructive and destructive interference of direct, surface-reflected, and bottom-reflected sound waves. Ed. note: This graph is a great picture of the degree of varation seen. Note a routine variation of 10-15dB, with some more dramatic shifts: at 400m, the sound shifted from around 127dB to over 150dB; and again, at just under 200m, from just above 130dB to over 160dB (around a general average at that distance of perhaps 150db). Given the increasing concern among biologists about behavioral disruptions triggered by noise, it is extremely important to acknowledge that real-world exposures can vary to this degree; many more animals respond behaviorally at 150dB and above, than down at 120-140dB. Carretta, Barlow, Enriquez. Acoustic pingers eliminate beaked whale bycatch in a gill net fishery. Marine Mammal Science, 24(4):956-961 (October 2008). This study documents a dramatic shift in beaked whale bycatch by gillnets set for sharks and swordfish in the California Current. Over the first 6 years of data, 1990-1996, 33 beaked whales died in the nets; after installation of pingers in 1996, NO beaked whales were caught by the nets over the succeeeding 11 years, though 260 cetaceans of 11 other species did drown in the nets. Ed. note: this result seems to dovetail well with observed reactions of beaked whales to other sounds; it appears they are espeically sensitive to noise, perhaps at a wide range of frequencies. Holt, Noren, Veirs, Emmons, Veirs. Speaking up: Killer whale (Orcinus orca) increase their call amplitude in response to vessel noise. J. Acoust. Soc. Am. 125(1), January 2009. This simple study came to a fairly dramatic conclusion: for each decibel of increase in ambient noise, orcas in Puget Sound increase their call levels by a decibel as well. The study took place in an area where boat noise is ubiquitous, and demostrates that orcas compensate directly and quickly to changes in boat noise during the course of their day. Ambient background noise levels were directly related to the number of boats observed within 1000 yards of the animals (sometimes as many as 45 vessels at a time); as boat numbers and background noise increased, so too did orcas call louder. The researchers note that "increasing vocal output to compensate for noise might have energetic costs, lead to increased stress levels, or degrade communication among individuals which could affect their activity budget. At some level, background noise could also completely impede the use of calls by killer whales for communicative functions." The authors also note that they did not observe any increases in call duration, unlike another recent study, and suggest that this may be because their study site included no times of "no boats," and that increases in call duration may be initiated when boats appear (or at a particular background noise level), while call amplitude may increase with increasing ambient noise. Principles of Marine Bioacoustics, by Au, Whitlow W.L., Hastings, Mardi C.
Principles of Marine Bioacoustics is about studying the acoustics of marine animals using underwater acoustic techniques. The book discusses and unites the various areas of marine bioacoustics in a single comprehensive text. It covers important subjects associated with marine bioacoustics such as the measurement and generation of underwater sounds, the propagation of acoustic signals in the marine environment and in small tanks, signal processing techniques, and advanced devices used in the field. Also covered are topics relating to marine animals, such as methods to record and acquire acoustic signals from animals, their auditory systems and vocalizations, psychological and physiological testing procedures, and echolocation in marine mammals. May-Collado, Laura J. and Douglas Wartzok. 2008. A comparison of bottlenose dolphin whistles in the Atlantic Ocean: Factors promoting whistle variation. Journal of Mammalogy, 89(5):1229-1240. This study looked at differences in dolphin whistles in different locations, and found that dolphins seem to adapt to noise in two ways. Dolphins produced relatively higher frequency whistles in the noisiest habitats, and when multiple boats were nearby, dolphins whistled with greater frequency modulation (ie more dramatically varying tones) and whistles were both longer and higher in maximum frequency than when a single boat was present. Zimmer, Harwood, Tyack, Johnson, Madsen. Passive acoustic detection of deep-diving beaked whales. The Journal of the Acoustical Society of America, November 2008, Volume 124, Issue 5, pp. 2823-2832. Beaked whales spend very little time at the surface, with foraging dives that last an hour or more, including about 30 minutes of active echolocation at the feeding depth. Visual detection is very difficult, so the possibility of using Passive Acoustic Detection (PAD) is an attractive complement to visual spotting. However, these high-frequency clicks attenuate rapidly. According to this paper, acoustic modeling suggests that in "good conditions,"e.g. wind speed of 2 m/s, a hydrophone close to the surface should detect beaked whales with a high probability within .7km. At the other end of the detection range, no whales would be detected at distances greater than 4km, except in very low ambient noise or unusually good propagation conditions. The detection curve generated by the models, drops steeply as distance increases, with a relative leveling off that suggest roughly 50% detection when whales are 1.5-3.5km distant. Additionally, the researchers substituted some actual dive profile data obtained in D-Tag studies, and found that in these instances, detection probability may rise somewhat, with 80% detection being possible at distances of 1.5-2.5 km. Actual detection of real whales is complicated by the fact that the sound of the clicks is highly directional; only clicks directed nearly directly toward the receiver will be heard at the modeled distances, but echolocating whales do scan in many directions, so at least some clicks from any whale should be detected. Finally, the relatively quiet interval between deep foraging dives can be as long as 110 minutes, meaning that listening time should be roughly 140 minutes to have a high probability of detecting if beaked whales are present. This, in turn, suggests that a slow-moving vessel (such as gliders or drifting buoys) will be more successful than a fast-moving active sonar vessel. (That is, if detections are only going to occur within roughly 4km, the listening platform should not move out of a relatively similar area during the 2-hour-plus PAD session.) Ed. note: While it has still not been confirmed to all observers' satisfaction, there is some evidence that beaked whales affected by mid-frequency active sonar may well have been tens of km from sonar vessels. Thus, PAD may be useful for avoiding nearby exposure, but may not fully mitigate for effects that could occur at greater distances, including fleeing in ways that disrupt the whales' post-dive recovery and oxygen/nitrogen rebalancing. In this paper, the authors demonstrate the usefullness of two statistical analysis formulas designed to measure the diversity of calls in an acoustic habitat, and the differences between two different habitats. Providing analytical rigor to support the idea that in healthy habitats, species will tend to occupy distinct acoustic niches, their two equations were designed as they worked with simulated acoustic communities, and tested in two Tanzanian forests. Using recordings made at just two sites, for five days and three times each day, they demonstrate that it is possible to asses the biodiversity of a habitat much more efficiently than by other, more labor-intensive methods. In the Tanzanian forests, a disturbed forest showed markedly less acoustic diversity than a nearby intact forest. This report contains fifteen papers presented at a meeting of researchers who are developing automated bioacoustic monitoring systems both in the ocean and on land. Papers primarily addressed computational methods for analyzing recordings in order to automate species identification, but some also presented longer-term results from particular resarch sites, including the waters around Sicily and PALAOA, an acoustic observatory in the Antarctic Ocean. Parsons, Dolman, Wright, Rose, Burns. Navy sonar and cetaceans: Just how much does the gun need to smoke before we act? Marine Pollution Bulletin 56 (2008) 1248–1257. This paper represents a clarion call by several biologists who are convinced that we now have enough information about the impacts of sonar on whales to justify the imposition of more stringent safety measures. In contrast to Navy insistence that there is no widespread problem, and to the slow and patient progression of scientific data to clarify exactly what the mechanisms that lead to strandings may be, these authors lay out a compelling case for a change in course. The paper begins with a litany of strandings that have stayed below the radar of most observers, including noting that there have been eight mass strandings in the Canary Islands in recent years, as well as little-studied multiple events in Japan and Taiwan, near US and Chinese training grounds. While delving into the current theories about what may cause the physical injuries seen in many stranded animals, they stress that these injuries, as well as less severe injuries, are likely triggered by avoidance reactions to sonar sounds. Strikingly, they detail several events in which it appears that animals found on the beach died at sea, and question why ocean biologists do not follow the standard used in terrestrial biology, where it is widely acknowledged that only a small proportion of animals that die are actually found by humans, and each body found is considered likely to be indicative of many others never discovered. The authors stress that current safety standards, based on avoiding temporary or permanent hearing loss, are clearly inadequate, pointing out that likely population-level effects are much more apt to involve sub-lethal and non-physcially injurious exposure levels that trigger behavioral and subtle physical changes, "e.g., repeated and widespread reduction in foraging or reproductive success, widespread impaired immune function, or large-scale displacement." They express particular concern about the conclusions of a recent US Noise Criteria Panel (see summary just below this entry), which recommended modest increases in the allowable sound exposure levels, based on improved data about what sound levels can cause temporary hearing loss. Here, they also make a fairly strong case that our reliance on hearing and behavioral tests using captive animals is likely producing distorted results (they note in particular studies that suggest belugas hear shipping traffic at 80km (rather than the 20km suggested by captive studies), and that common dolphins may avoid seismic surveys when sound levels are only 48dB, orders of magnitude lower than captive studies suggest they'd respond to. They conclude that "it must be assumed that military exercises involving sonar are not just affecting a small number of beaked whales, but are likely to be having wider effects on the ecosystem and quite possibly causing loss of biodiversity (at least locally, as appears to be the case in the Bahamas)." The paper continues with a summary of the many statements of concern that have been issued by international bodies since 2001, though so far only the Canary Islands have responded with concrete policy changes (banning active sonar off its coasts). Noting that low-frequency sonars are likely to create both physiological and behavioral reactions at much greater distances, the authors conclude their paper with this statement: "we contend that there is already enough evidence to know that the current efforts to protect cetaceans from the consequences of exposure to sonar and undoubtedly other intense anthropogenic sound are inadequate and that additional protection measures are therefore required." This document presents a matrix approach to help organize diverse studies that address the effects of noise on marine mammals. One section proposes specific criteria for preventing physical injury (Level A harassment), and another section collects available (and largely ambiguous) data on behavioral responses to sound. Using a number of assumptions (some being informed leaps of faith and others designed to be precautionary) and extrapolating from improved but still relatively few studies of TTS, the authors propose to increase the Level A criterion from today's 180-190dB widely used limits to 198-215db (SEL) and 230dB (SPL peak) for whales and dolphins, and somewhat lower levels for pinnipeds. The behavioral response matrices are especially useful as a way of organizing widely divergent data, since behavioral responses tend to vary greatly between species and even among species, depending on what behaviors individuals are engaged in. However, a general pattern is evident, suggesting that many species are quite sensitive to noise at levels much lower than currently regulated (110-140dB RMS SPL). The paper concludes by stressing the need to expand study of noise impacts from marine mammals, to consider effects on fish, invertebrates, and polar bears, and to consider the likelihood that effects on any of these groups could cascade through the food chain to affect entire ecosystems. In many ways, the approach taken by this team follows on that sketched out in a related volume published in 2005 by the National Academies of Science, which attempted to create a functional framework for assessing the biological impact of repeated behavioral disruption. In both cases, the resulting publications suggest the use of a "matrix," within which we can organize existing (and more importantly, future) data. These matrices allow us to set different noise criteria for animals with different hearing and vocal ranges (e.g. large whales/low frequency and dolphins/higher frequency), as well as for different types of sound sources (e.g., single pulse like an explosion, multiple pulses like airguns or pile driving, and nonpulses like shipping, sonars, or seafloor processing of oil and gas). The resulting matrices look at the ways that a given sound will be heard by and affect animals in each of the different "functional hearing groups." The result can seem to be a complex jumble of information, raising fears of leading to a confusing diversity of noise standards, but the researchers are clearly making a rather herculean effort to create a practical way to organize what is, at this point, a sketchy but diverse set of data (it is not uncommon to have only a handful of studies, if that, of any particular noise source on any particular hearing group). The report separates acoustic impacts into two classes, roughly equivalent to those used by US regulatory agencies: physical injury (Level A Harassment) and behavioral change (Level B Harassment). In this first attempt at assessing the data on physical injury, the collaborators also lean toward what they consider a precautionary standard, lumping together several matrices into proposed exposure limits that match what they consider to be the most acoustically sensitive of the groups or physiologically dangerous of the sounds that are being considered. Moving into the behavioral effects section of the study, things get much less definite. While the authors were willing to make fairly universal recommendations about protecting animals from physical injury (by presuming that fundamental physiology does not differ markedly between species), there are clearly wide variations in behavioral responses between species, and between individuals of any species, along with clear differences in sensitivity depending on what activity the animals are engaged in. While the "most precautionary" standard for physical injury leads to a noise limit that is sufficiently high (200dB or more) to be applied at sea without changing our behavior, to set behavioral thresholds based on the most sensitive individuals, species, or situations would require limits so low (120-140dB) as to likely cause major disruptions in shipping, naval, and oil and gas operations at sea. (Not to imply a need for such extreme precautionary limits: in most situations, animals are far enough away or less sensitive than the extreme cases, so such limits would likely be overkill). As a criteria for injury, they use permanent shifts in hearing sensitivity (PTS). They also consider two ways of measuring sound exposure: peak Sound Pressure Level (loudest sound level experienced) and Sound Exposure Level (cumulative sound energy experienced), and suggest setting exposure criteria such that the lowest of the two thresholds becomes the de facto standard. Bottom line: for all species of whales and dolphins, they suggest an upper limit of 230dB re 1uPa (peak, flat) or 198dB re 1uPa2-s (SEL, weighted to hearing groups' auditory curve) for single and multiple pulses, with the SEL limit raised to 215dB for non-pulses. These represent modest increases over today's widely used de facto standards of 180-190dB for Level A Harassment; however, such sound levels only occur very close to sound sources (even loud sound sources such as airguns and military sonar), so very few animals are generally exposed to these levels of sound. While the researchers are completely transparent with their method of coming to these figures, we should highlight a few key points made in passing in their narrative. First, PTS thresholds are based on measured TTS (temporary hearing changes) in lab settings; there is only good TTS data on two species (both mid-frequency dolphins), and this is assumed to apply to all cetacean species. Second, the difference between measured TTS onset and assumed PTS onset is based on studies of very different animals, both terrestrial mammals (researchers do not want to deafen dolphins to discover the true values). In some cases, studies on chinchillas are used, augmented with some arbitrary (and likely precautionary) changed assumptions about the ways that tissues respond to increasing sound to create tissue damage and TTS. In other cases, the assumptions are based on human studies of the ways that hearing loss compounds above the first onset of TTS and gradually causes PTS. It should also be noted that this study covers not only dolphins and whales, but also pinnipeds (seals and sea lions), in both air and water, where again, the most precautionary studies become the basis of recommended exposure criteria (in one case, the proposed criteria are "based on the results from a single individual"). Finally, the researchers suggest using lower criteria for beaked whales, at least for non-pulsed sounds including mid-frequency tactical sonars, but refrain from making a specific recommendation. Because of the wide variation in responses, the authors refrained from making any specific recommendations about noise limits to minimize behavioral disruption. Instead, they created a set of matrices that are designed to be used in coming years to both organize new data and to design studies to fill in the many gaps in the data that they reveal. These matrices make for fascinating study: there is one for each of the sets of "functional hearing groups" and sound type (e.g., one for low-frequency cetaceans and single pulses, one for low-frequency cetaceans and multiple pulses, and one for low-frequency cetaceans and nonpulses; with the same set for each of the 5 hearing groups). In each matrix, the authors compile results from existing studies of that sound type and that hearing group, arranged with increasing received sound level across the top (in 10dB steps, from 80-200dB RMS), and increasing severity of behavioral change up the left side (a 0 to 9 scale, from brief or minor change, through moderate changes in swimming or vocalizing, to obvious and extended changes in behavior). Each chart shows the cumulative total of individuals that responded at each level of severity to each level of sound exposure. The fascination comes in seeing the wide range of responses shown in virtually every chart; in some cases, a given dB level of sound exposure includes observed reactions at every level of the scale, from no response at all to very obvious disruption, and similarly, a given severity of response (say, obvious flight) can be observed at low sound levels, but not at higher levels. The challenges to setting an absolute limit are clear. At the same time, though, the reasons that many environmentalists (and increasing numbers of scientists) are raising concerns about widespread and systemic noise impacts is also made crystal clear. The chart of mid-frequency cetacean (including most dolphin species) responses to non-pulses (primarily studies of boat noise) is striking: over half the extreme reactions observed (rated at Level 8: obvious or long-term avoidance of the area, prolonged separation of females and calves, prolonged disruption of mating behavior) occurred at sound levels of 100-130dB re 1uPa RMS, those these results are somewhat confounded by the fact that at the same time, a majority of the animals who were exposed to 100-120dB showed little or no response. Also striking, and less ambiguous, are the low-frequency cetacean (baleen whales) responses to nonpulses (which include sonar, shipping, and enduring oil and gas noise such as drilling or seafloor processing). Here, a clear threshold appears in the data: at below 110dB, virtually all observations show little or no response, but at both 110-120dB and 120-130dB, the majority of individuals observed respond at "level 6" (avoidance, brief separation of females and calves, extended changes or cessation in vocalizing, visible startle response, brief cessation of reproductive behavior). Low-frequency cetaceans also showed quite a threshold in response to multiple pulsed sounds (e.g. airguns): 60 out of 75 responses at 110-120dB were rated Level 0 (no response), while 47 out of 72 at 120-130dB were at Level 6; this clarity is somewhat muddied by a wide range of responses to sound at 150-180dB, with clusters at both Level 0 and Level 6. Another stark, though less severe, threshold is seen with pinnipeds in water: the vast majority of responses to 120-130dB sound are at Level 0, and then jump to Level 4 at 130-140dB. This section of the report is also enhanced by accompanying tables that detail all the studies that are compiled to create the numerical averages across each specific chart. These tables highlight whether a given study saw consistent or varied response to the sound levels in particular situations. Sometimes, the responses were all the same, say 6, while in other cases, a single study observed reactions ranging from 0 to 6 to a particular sound exposure and situation. In addition to the obvious need for direct data on TTS in more species, the authors suggest that future research could be designed to fill in some of the gaps, or areas of extremely little data, in the behavioral response charts. This ongoing compilation of data will also help communicate new findings to those engaged in related research. In addition, they encourage greatly expanded study of ambient noise levels and patterns of biological sound in different ambient noise conditions, specifically mentioning the potential of remotely deployed passive acoustic monitoring systems to "become the new standard." The paper concludes by stressing that we have very little data on the impacts of noise on ocean life other than marine mammals, and that both more basic research and noise criteria standards "are perhaps as urgently (or more urgently) needed for some other groups" of marine life, including fish, invertebrates, sea turtles, sea otters, and polar bears. And finally, the authors address the need for noise criteria that consider ecosystemic effects: "...The effects of noise exposure on some elements of the local food webs may have a cascade effect to other elements within the web...such ecological effects should be anticipated." Caroline Weir. Short-Finned Pilot Whales (Globicephala macrorhynchus) Respond to an Airgun Ramp-up Procedure off Gabon. Aquatic Mammals 2008, 34(3), 349-354. Although gradual ramp-up of noise sources such as airguns and sonar is widely used as a mitigation measure meant to give marine animals a "warning" that will spur them to move away before sound levels become dangerous, there have been very few studies designed to see whether ramp-ups do in fact spur animals to move to a safe distance. This paper serves two useful purposes: it reports on a very clear and detailed response of a group of pilot whales to a seismic airgun array ramp-up procedure, and it references, with brief summaries, many of the key previous studies. During a seismic survey off the coast of Gabon, a pod of pilot whales was observed for 24 minutes before the onset of the ramp-up, as they traveled in generally the same direction as the survey vessel, which gradually approached them from behind. Ramp-up began when the ship was 900m behind them. For the first ten minutes of the ramp-up, there was no response from the whales, but when the ship was about 750m behind them (firing 940 cubic cm of air volume), they veered suddenly 90 degrees to the right, moving away from the ship's track line. When they were 900m away (airguns at 1430 cubic cm), they milled for a few minutes, then gradually increased their distance from the ship to 1.3km. For a few minutes, they again meandered in one area, orienting toward the airguns as their output increased from 2,980 to 5,460 cubic cm and the ship passed abeam the group, after which they regrouped and headed off in the opposite direction as the ship's continued movement. The author notes that it is impossible to know whether the initial movement away from the vessel was triggered by the gradual increase in the sound level reaching a point at which they decided to move away, or if the group moved when they first heard the sound, and responded to it in something like a startle response. She also notes that the movement away was limited in time and space: after the initial movement away, "despite a four-fold increase in source volume....the whales exhibited behavior best described as milling." Mark Simmonds. Defending the "Non-Human Persons" of the Sea (book review). Aquatic Mammals 2008, 34(2), 257-258. This book, written by a professor of business ethics, makes the case for dolphins to follow chimpanzees in humanity's dawning awareness that other animals may deserve protections similar to what we have up til now termed "human rights." The dolphins’ case is carefully compared with our own “human rights”: the right not to be bought or sold; the right to liberty; the right to freedom from torture and from murder. This book questions why humanity is so special that we qualify uniquely for such rights relative to other animals? Many people probably view the answer as obvious: We are simply qualitatively and quantifiably “superior” to other animals in terms of intelligence. However, intelligence is not easy to define or measure, so we have tended to focus on attributes like “self-awareness,” empathy, and the possession of language. Nonetheless, studies in the last few decades have begun to shake our complacency about our specialness and our right to dominion over the other animal species as several of them have “stepped up” and passed the tests that we thought uniquely defined us....(Thomas White's) painstaking examination of the evidence leaves little doubt that the rights of cetaceans should be recognised. His review is also highly readable and very entertaining in places as he details fascinating accounts of dolphin behaviour to support their case. to mitigate those risks." Further, "a key message of this report is that it is unlikely that a small number of focused experiments will provide the information necessary to solve most of the major concerns. Instead, one must rely upon an accumulation of evidence combined with a process of objective assessment of this evidence through periodic independent review. Recent efforts have focused upon a review phase in this process (see Cox et al. 2006; Southall et al 2007 and other literature cited in Annex I); there is now a need to achieve a rapid improvement in the state of knowledge by undertaking new research that is focused on specific questions of high priority." To provide more concrete examples of the approach they recommend, the report sketches the likely research questions that would unfold over time in three key areas: the effects of active sonar, especially on beaked whales, the effects of seismic surveys on marine mammals, and the effects of shipping noise. In each case, the report details first-layer questions that need to be answered, and then moves to the more detailed studies that could begin to answer these questions. Throughout, there is a keen awareness that one set of research questions must be answered in order to address the next (e.g., we need to know the levels of sound actually being experienced by beaked whales in order to evaluate the responses that are observed, which then will inform studies of longer term impacts on individuals and populations). This report is highly recommended for NGOs, researchers, and agency personnel. My only reservation about the framework that it puts forward is that it is somewhat limited by the need and goal to focus on step-by-step methodical integration of diffuse data—as is too common, the bottom line is focused on evaluating "vital rates" and "life functions," which leaves less concrete issues like stress, annoyance, and the underlying ethical question of the relationship between human activities and wild nature out of reach. Yet this is a potentially powerful approach that, were it to be followed through, could provide a useful framework for coordinating research in ways that could accelerate the development of much-needed understanding of the effects of noise on ocean life. Song, Mann, Cott, Hanna, Popper. The inner ears of Northern Canadian freshwater fishes following exposure to seismic air gun sounds. J. Acoust. Soc. Am. 124 (2), August 2008, 1360-1366. Since a 2003 study that found seemingly permanent damage to ear sensory cells in a species of ocean fish held in chages near active airguns, there has been concern about how widespreead this effect might be. In this new paper, which elaborates on a paper published last year, freshwater fish were used as test subjects (because of increasing interest in oil and gas exploration in river systems including the MacKenzie in northern Canada). The first paper found some temporary hearing loss in some speices, and this paper looks deeper, finding no damage to auditory cells. The fish in this study were also held in cages close to airguns, and were exposed to sound at high levels (205-209 dB re 1uPa (peak), alternatively calculated as SEL of 176-180 dB re 1uPa). In considering the contrast to the 2003 study from Australia, the researchers note that there were differences in airgun size and sound exposure, and speculate that the much shallower river environment (and resultant weakening of low-frequency components of the sound) may also be a factor. This is a very useful, straightforward introduction to basic principles of marine acoustics, available free from the MMC website. Sections include: what is sound, and how does it travel; the ocean environment; sources and types of sound in the ocean; sound propagation, spreading, scattering in different depths of water; and hearing in humans and marine mammals. Throughout, useful charts and diagrams illustrate the principles, and a series of "points to remember" highlight specific ideas that often can cause confusion. McDonald, Wiggins, Hildebrand, Ross. Ambient ocean noise near San Clemente Island: a bathymetrically complex coastal region off Southern California. Journal of the Acoustical Society of America, in press. This review includes summaries of most of the studies of ambient and shipping noise in the range of the southern resident orca pods of the Pacific Northwest. Topics covered include ambient sound patterns, shipping noise, whalewatching noise, orca auditory capabilities and auditory effects of sound exposure, including masking and hearing loss, and behavioral changes in the presence of excess sound. An important section looks at the emerging concept of "zones of influence" of sound: the zones of audibility, response, masking, and hearing loss or injury. The report concludes with a section that assesses the likelihood of acoustic impacts and suggestions for future research. The report is a treasure-trove of clear information on noise/sound impacts. Among the points that stood out in my reading are the following. Ambient noise is generally elevated at least 10-15dB by small boats, and 20-25dB by large ships (another study indicates increases more in the range of 50-70dB in the presence of various boats). The section on hearing senstivity makes a point about captive animal testing that is rarely noted: when animals receive negative reinforcement for reporting a "false positive" (i.e. responding as if hearing a sound, when no sound was played), they may well become conditioned to be conservative in their response to faint sounds, and so the results can easily underestimate the hearing sensitivity of the species (for orcas, only two studies have been done on captive whales to assess hearing senstivity curves). Tentative measurements of the critical ratios for orcas (tentative because, again, there are few test subjects) suggest that they are more affected by masking than many other toothed whales: to hear a target sound in noise, the target sound must be 20dB louder than ambient at 10kHz, and 20dB louder than the noise levels at 80kHz. There are some indications that orcas spend less time feeding and more time traveling or resting when boats are nearby (within 100m or 400m); likewise, they may travel in less direct paths in the presence of boats within 1000m (though interestingly, one study suggests that when there are many boats present, paths are more direct; perhaps there is little use in trying to avoid boats in this instance). An interesting study (based on models, not measured/observed results in the field) suggest that the presence of boats can significantly decrease the detection range for an orca ecolocating on a salmon: boats at 400m decreased the detection range by roungly 35-90%, and boats at 100m decreased the detection range to as little as 0-20m, or 90-100%. Hester, Peltzer, Kirkwood, Brewer. Unanticipated consequences of ocean acidification: A noisier ocean at lower pH. Geophysical Research Ltters, Vol. 35, L19601. This is a theoretical, rather than field research, study that calculates the likely current and future decreases in sound absorption caused by increasing ocean acidity (lower pH). The bottom line result is sobering for anyone who is already concerned about the rising tide of ambient noise in the world's oceans. Increasing shipping noise, in particular, is reducing the effective communication ranges of great whales and creating an urbanized environment in many coastal areas. This research suggests that the well-documented increases in ocean acidification are already helping sound to travel further, with dramatic increases likely in coming decades. The paper considers four causes of increasing ocean acidity, including deposition of CO2, Nitrogen, and Sulphur, and some chemical effects of warming (which itself contributes in a much smaller way to decreased sound absorption). The net result is that it appears likely that low- and mid-frequency sound absorption has already decreased by 10-15% as ocean pH has gone down by .12; this means that sound travels 10-15% further, with the effect that background ambient noise levels (predominantly wave noise and shipping noise at the frequencies being impacted) rise as the cumulative noise in any one place contains source noise from a larger area. The most dramatic impact is in sound below 1kHz, with significant effects up to 10kHz. Projections for the continued acidification and therefore furher increases in sound propagation suggest that by 2050, we will easily hear a 30% increase in sound propagation distances (based on a low-end prediction of a decrease in pH of .15); more likely is a 40-60% increase in sound propagation distances at 1kHz with pH decreases of .30 to .45. Meanwhile, the models suggest a corresponding 20% increase in propagation of 10kHz sounds in all pH scenarios. Simmonds, Dolman. All at sea: renewalbe energy production in the context of marine nature conservation. populations and yet, in our experience, this rarely seems to happen. Carstensen, J., Henriksen, O.D. and Teilmann, J. 2007. Impacts on harbour porpoises from offshore wind farm construction: acoustic monitoring of echolocation activity using porpoise detectors (T-PODs). Marine Ecology Progress Series 321: 295–308. Prior, McMath. Marine mammals and noise form offshore renewable energy projects—UK developments. This paper notes that offshore wind farm development in the UK has taken place in licensing "rounds," with rapid increases in the size of wind farms being built. Round 1 was an initial demonstration phase, with eleven projects permitted so far (and five in operation), each relatively small in scale (less than 30 turbines) and relatively short construction phases (as short as one month). Fifteen Round 2 projects have been proposed (with four approved so far); these are larger developments often including hundreds of turbines. Round 2 construction will likely take place over a number of seasons, so construction disturbance will be longer and the impacts could be different than those seen in Round 1. In addition, piles of up to 6 feet in diameter have been proposed to support larger turbines; this will lead to substantially increased noise during construction, with disturbance impacts extending over tens of kilometers. Proposals for Round 3 are currently undergoing Strategic Environmental Assessment; however, the proposed capacity of development may be as much as four times the eventual level built out under Rounds 1 and 2 combined. Concern over cumulative impacts may be prominent during the consenting process, particularly if construction operations on adjacent sites takes place concurrently, giving rise to the potential for longer term and geographically widespread increases in underwater noise. In a paper summarizing the results from acoustic monitoring at two Danish offshore wind farms, results clearly show a dramatic difference in harbour porpoise responses. At one wind farm, Horns Reef, porpoises numbers decreased modestly during construction (both inside the farm in in monitoring sites 10km away), and decreased a bit more during early start-up, when maintenance activity was highest, but rebounded to baseline (pre-construction) levels early in the first year of normal operations. However, at the Nysted wind farm, the decrease in porpoise numbers that likewise began during construction was not reversed during the first two years of operations: porpoises mostly avoid the wind farm (though numbers were slowly increasing by the end of the second year), while they returned to the areas 10km away once construction ended. The authors note two possible explanations for the different long-term impacts of the wind farms. The area around Horns Reef is an important harbour porpoise habitat, with a larger natural population density; it is possible that the "the porpoises around Nysted are not particularly interested in the area and will simply avoid it if disturbed." In addition, the area around Nysted is relatively sheltered, whereas Horns Reef has higher wind and waves, and thus a higher background natural ambient noise level, so that "the relative noise level from the turbines is higher and audible to the porpoises at greater distances at Nysted than at Horns Reef." The authors conclude that "it can be concluded that the same species may react differently to similar types of disturbance (wind farms) in different localities. This is an important conclusion for future monitoring programmes of wind farms and other offshore installations." This study, using opportunistic observations in the Mississippi Sound (a 90-mile intercoastal waterway, between the coast and a series of barrier islands; depths up to 20 feet), evaluated the responses of bottlenose dolphins to the appearance of personal watercraft (jetskis). In just under half the incidents, a dolphin group's behaviour changing within one minute of the presence of a high-speed personal watercraft. The most notable changes were that groups that were feeding shifted dramatically to "traveling"mode. Interestingly, groups of dolphins that were already in "traveling" mode often paused and began "milling." In addition, mean dive duration increased dramatically, from 12-16 seconds to 42-82 seconds. Researchers note that "The results demonstrated an immediate, short-term change in dolphin behaviour, suggesting that an increase in the frequency of high-speed personal watercraft in this area could produce long-term detrimental effects." The authors suggest more research into the differences in reactions to high-speed and lower-speed jetskis and the effects of increasing distance of jetski approach; in addition, they note that long term studies of growth and reproduction in places with different densities of personal watercraft would help clarify any population-level impacts that may accumulate over time. Yet another study that shows that interactions with boats, in this case, tour boats, causes dolphins to interrupt their foraging behavior, and increase milling and socializing behavior. In this case, the dolphins being studied reduced the proportion of time they spent foraging from about 35% of the time, to under 25% of the time, when boats were present. Average length of time spent foraging decreased from 10 minutes to 6 minutes when the tour boat was nearby, and once interrupted, it took the dolphins 54% longer than normal to return to foraging (14 minutes on average, instead of 9). As tour boat trips increase, the proportion of time that dolphins are disrupted is also increasing; at the study site, the dolphins spent 29% of their time in the presence of a tour boat, and since the study was completed, a second tour operator began trips in the same area. For four summers, from 2002-2005, a diverse team of researchers studied the sperm whale populations of the northern Gulf of Mexico; this final report presents the results of three distinct lines of research: to learn more about the population sizes, social patterns, and group and individual behavior of this population of sperm whales, to characterize habitat use in this area, and to examine possible changes in behavior in response to the noise of seismic survey airguns. By all accounts, the study was very successful on the first two counts, dramatically increasing our understanding of the overall populations and habitat use, especially in the key areas of the Gulf where the oil and gas industry is moving into deeper waters. It is the third topic, effects of noise, that especially interest us here at AEI, and on this count, the results were not as clear-cut. Over the course of two field seasons in which researchers attached acoustic D-tags to sperm whales, only a total of eight whales were tagged and subsequently exposed via controlled exposure to air guns towed by ships participating in the study. In each case, the whale was tagged while the seismic survey vessel was 7-13km away; after tagging, the researchers collected pre-exposure data, then the ship fired up its airguns and slowly moved closer, aiming to keep the sound going through two complete hour-long dive cycles, so as to monitor changes in foraging clicks (seeking prey) and buzzes (zeroing in and attempting to capture prey). A final post-exposure period followed, while tags were still attached. Exposures occurred at levels from 111 to 147 dB re 1uPa (rms) , alternatively measured as 131-164dB peak-to-peak, at distances of 1.4-12.6km. While it appeared that there was no horizontal avoidance (i.e., the whales did not move away from active airguns or change direction of movement when guns were turned on and ramped up, or when they were at full power), the study notes that "the sample sizes were insufficient to be completely confident that there were no horizontal or vertical responses," while also stressing that this population may have been habituated to such noise over many decades of oil and gas exploration and development, so that the results can not be easily applied to populations in more pristine locations. Further, the study found that "it is more likely than not that some decrease of foraging effort may occur" when airguns are active, at least in some individuals. Using complex statistical analysis to try to tease patterns from this limited data set, the researchers conclude that a decrease of 20% in foraging activity is likely. Strikingly, one whale apparently ceased foragingand this was the whale that had the highest received sound levels; it rested at the surface for over four hours during airgun activity (much longer than normal), and dived to feed immediately after the airguns were shut off. Nevertheless, the study did conclude that the population of sperm whales appears to be healthy and thriving, and that oil and gas exploration activity does not drive the animals away. Supporting the controlled exposure data was a larger number of animals that came within earshot of industrial surveys taking place in the Gulf. As part of the long-term population studies, S-tags (satellite tags, noting horizontal location, but not dive patterns) were attached to 53 whales. Of these, 34 came within 100km of active survey vessels (sometimes within 100km or two or three vessels), while 12 whales came within 25km of survey vessels. Whale locations appeared random; that is, statistical analysis suggests there was no avoidance of the active airguns. It is noted that no whales came within 5km of an active survey vessel, though the researchers suggest that a total sample size of 75 would be necessary for this to be considered a statistically significant indication of close-range avoidance. A final important finding was that the actual received levels of sound did not match those expected based on the models generally used to predict sound exposures and safety radii. Several factors were noted, especially that any given airgun blast results in a series of noise arrivals at a distance, as the sound travels different direct and reflected pathways, and that surface ducts can allow sounds to travel further than expected. 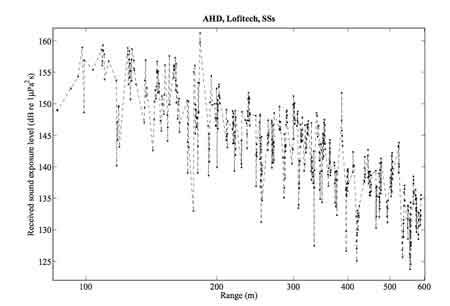 At times, received levels reached over 160dB (peak to peak) at ranges over 10km.There was significant energy at higher frequencies than typically considered in airgun effects modeling (up to 3kHz, rather than the expected frequency range of below 500Hz). This paper reports preliminary results from an ambitious multi-national Controlled Exposure Experiment using acoustic D-tags, which allow researchers to record received sound levels while charting dive patterns. Six orcas were tagged, with 17 hours of data collected, with one animal exposed to LFAS signals, two to mid-frequency active sonar signals, and one used as a control, fewer samples than hoped. The whale exposed to LFAS signal did not change its behavior, nor did its companions. However, the group exposed to mid-frequency sonar signals ceased feeding and moved rapidly away; in addition, they exhibited an unusual dive pattern, diving roughly twice as deep (over 60m) as normal (20-45m), including a highly unusual reversal of their ascent (coming up to 15m from the surface, then retreating again to 60m). [Ed. note, not part of the report narrative, based on observation of included diagrams: Four other dives during the 35-minute sonar transmission were within the normal range of depth (the deep dive was the third of five dives during sonar transmission), with three longer than normal rest periods at the surface during the hour after sonar transmission ceased.] Received levels did not exceed 150dB re 1uPa. Looking at longer-term responses, while the experimental use of sonar in the herring trials did not seem to deter orcas from the general area, by contrast, no orcas were seen during three days of a planned Navy exercise in the area that included mid-frequency sonar use. The herring trials used bottom-mounted sensors to chart the mean depth of a school of herring as a sonar vessels passed nearby. Herring at shallow depths (25-50m) tended to show a minor downward reaction as the sonar source ship passed overhead, while herring located deeper, or in less dense schools, showed no detectable reaction; no horizontal avoidance was seen. While herring hearing curves suggest they should be able to clearly hear LFAS signals, but not mid-frequency signals, the responses were the same for all signals (including ship-only, no sonar), suggesting that the herring may have been responding to the sound of the ship, rather than the sonar signal; such reactions to ships have been seen for many fish species. A related trial using orca echolocation signals on the herring showed more of a response, suggesting that the herring could distinguish between the mid-frequency sonar and the orca sounds, but the three trials all produced slightly different response patterns, suggesting the need for further study. In this wide-ranging literature review, Peter Tyack of Woods Hole Oceanographic Institute sketches the history of research into the effects of noise on marine life, with some references as well to effects seen in terrestrial creatures. He begins by noting that while acute disturbance of individuals attracts the most attention, the likely more profound effects of chronic disturbance on population vitality (success in foraging and mating) are much harder to discern. Several examples are presented of studies that documented both temporary and long-term abandonment of key habitat when loud noise was present (including grey whales abandoning a birthing lagoon for several years, then returning when the salt production facility was abandoned, and dolphins moving away from foraging habitat when shipping traffic is heavy). Next, Tyack turns to a detailed examination of the question of whether global shipping may be dramatically decreasing the area within which whales can hear each other's calls, beginning with the thought that the unintentional consequences of increased shipping noise may be creating unexpected problems analogous to those created by the introduction of industrial-waste gasses into the atmosphere, which went unnoticed for decades. Following on models created in the 1970s, updated to take into account the hundred-fold increase in shipping noise since then, he notes that "the increase in ambient noise from shipping seems to have reduced the detectable range of low frequency whale calls from many hundreds of kilometers in the prepropeller ocean down to tens of kilometers in many settings today." (For example, the finback whale range shrank from at least 400km in the pre-engine ocean to 90km in the 1960s, down to 32km today.) He notes that, as populations of great whales fall, the separation between them may increase, with these increases in shipping noise compounding the challenge of finding mates or sharing information about active feeding grounds. However, he then goes on to point out that there is, so far, no clear evidence that the great whales do indeed communicate over long distances; clear responses to the calls of other whales have been seen only at ranges of 10km or less; the fact that a human acoustic sensor can detect a signal at 400km does not necessarily mean that the whales themselves rely on hearing signals at such distances. He suggests that acoustic tags may help to clarify whether distant, faint signals from conspecifics (whales of the same species) do in fact trigger any discernable reaction (calling in response, or moving toward the distant whale). While noting that it may be impossible to design scientifically valid studies to uncover the possible cost of "lost opportunities" when communication is drowned out by shipping noise, an indirect way to get at this question is within reach of researchers: if animals alter their calls in noisy conditions, we can infer that the noise is disrupting their normal communication channels. And indeed, Tyack notes a long list of studies that show such changes, such as beluga whales and manatees increasing the volume of their calls in noisy conditions, and an apparently dramatic increase in the frequency (pitch) of right whale calls in sections of the ocean where low-frequency shipping noise is more intense. While noting that these and other studies "suggest that vessel noise clearly does interfere with communication in marine mammals," Tyack also notes that we do not know how costly these adaptations are, or what noise level would preclude such compensation. Also, he asks, "When does noise so degrade the usefulness of a habitat that animals leave? Can this level be predicted by the compensation behavior?" As of yet, these are unanswered, and difficult to answer, questions. Finally, Tyack turns to research that show clear disturbance reactions to ocean noise, including killer whales staying 4km away from acoustic harassment signals near fish farms, dolphin numbers dropping to 8% of normal within 3.5 km of similar noise-makers on other fish farms (with those small numbers implying that the avoidance distance was far greater). He notes that the degree of displacement or behavioral response is not necessarily a direct indicator of the severity of impact, suggesting that "if an animal is in bad enough condition that the risk of altering behavior is high, then it may be less likely to show a disturbance response." For example, hungry animals will linger in a feeding area the longest. He also notes that some responses to noise may be caused by noise sources that resemble a predator's call (as in recent modeling Tyack has done that suggests beaked whale decompression sickness may result from a long series of near-surface dives as the whales flee sonar signals that they mistake for orca calls). He cites some compelling studies on terrestrial animals showing that repeated disturbance exacts high costs in reproductive success and overall health (including a study of geese that showed that when undisturbed, geese increased their body mass and had a 46% breeding success, whereas in nearby areas where farmers scared them off their fields, they did not gain mass and had a breeding success of only 17%). To conclude, Tyack suggests that there are several lines of research that have so far received little attention, which could help to move key understanding of noise impacts forward, including: focusing on the most vulnerable animals as subject of study into the effects of disturbance, further study of the possibility that predator responses underlay key behavioral impacts (including fleeing, increased vigilance, and avoiding habitats), and following up on the recent theory of allostasis (behavioral changes that allow an animal to maintain equilibrium in the face of external environmental changes or stressors) as a way of understanding the costs and benefits of changing behavior in the face of noise. This 400+ page report is the culmination of a multi-year initiative by the MMC. It includes about 60 pages of summation, followed by several lenghty appendixes, the most substantial being a 160-page species-by-species assessment of endangered, threatened, and depleted marine mammals, focusing on historic and current populations, and the status of protection programs for each, and a 30-page report on the population viability of each species; two other sections address Right whale recovery efforts, as this species is a major focus in the eastern Atlantic. Among the goals of the report is to make recommendations as to how best to prioritize population recovery efforts, within the context of limited funding. The report notes, for example, that some species have received relatively high levels of attention via directed funding (e.g., western Sterallar sea lions), while others have not received enough funding to prevent or even fully understand their ongoing declines (e.g., Cook Inlet beluga whales). Its key recommendation is that a coherent national strategy be developed, centered on a dynamic and adaptable approach that includes both a separate funding stream for research and management for marine mammal population recovery, and a strategy to prioritize recovery attention basedon objective criteria including risk of extinction, expected conservation benefits, competing conservation needs, based on a structured and transparent risk/benefit analysis. One striking element to the MMC report is the consistant attention paid to noise as a key factor in species stress, decline, and recovery. Caroline Weir. Overt Responses of Humpback Whales (Megaptera novaeangliae), Sperm Whales (Physeter macrocephalus), and Atlantic Spotted Dolphins (Stellena frontalis) to Seismic Exploration off Angola. Aquatic Mammals 2008, 34 (1), 71-83. During ten months of seismic surveys off the Angola coast, 2769 hours of marine mammal observations were made from a survey vessel, seeking to determine whether marine mammals avoided the airgun noise. This study did not examine subtler responses, such as dive patterns or call rates, but simply tracked sighting rates and distances. The total number of marine mammal sightings was rather small, given the long timeframe (66 humpbacks, 124 sperm whales, 17 dolphins); the author does not offer any hints as to whether populations are simply low in that area, or whether observations were limited for any other reason (weather, single observer, high seas, etc.). Airguns were active roughly half the time, providing a balanced set of data to look at. The mean distance at which all species were seen was greater when airguns were active than when they were silent, though only the dolphins showed a statistically significant difference. The closest approach of humpbacks averaged 3000m with guns off and 2700m with guns on, with sperm whale results virtually identical; dolphins, by contrast, came much closer during guns-off, 209m, than when guns were on, 1080m. Perhaps unexpectedly, more whales were seen at virtually each distance charted (from 1km to 6km) when the airguns were on--while this could indicate a lack of avoidance behavior, it is also possible that it was caused by the whales staying at or near the surface while airguns were active, a "vertical avoidance" of higher sound levels at depth (near the surface, the airgun noise is reduced by destructive interference as sound bounces off the surface). Counter to expectations that the large whales would be more sensitive to the predominantly low-frequency airgun noise, the dolphins were much more dramatically affected. All nine times that dolphins approached the ship occurred only in airguns-off periods, and on one occasion, an approaching group of dolphins clearly veered away as the airguns ramped up. While the dolphins clearly avoided an area near the ship, there was no evidence that the seismic survey activity displaced any species from the region; sperm whale sightings increased over the course of the survey. Smultea, Mobley, Fertl, Fulling. An unusual reaction and other observatoins of sperm whales near fixed-wing aircraft. Gulf and Caribbean Research Vol 20, 75-80, 2008. Reports of sperm whale reactions to airplanes and helicopters have been nearly all opportunistic observations, with the few published reports or studies offering conflicting views. During this population-monitoring study, careful records were kept of any visible behavioral reactions, as part of the NMFS permit conditions. While the majority of whales encountered seemed to exhibit no obvious reaction (none of the groups that were over 360m responded in ways obvious from the air), a significant subset of groups that were approached within 360 m (3 of the 8 groups) did indeed respond with sudden dives as the plane first appeared, and a fourth group took up group formations the researchers interpreted as agitation, distress, and/or defense. In the context of this population survey, such disturbance was transient and likely insignificant in terms of population health. However, the researchers note that "repeated or prolonged exposure to aircraft overflights have the potential to result in significant disturbance of biological functions, especially in important nursery, breeding or feeding areas." They suggest that such cumulative effects could be possible in areas frequented by military training exercises, ecotourism flights (e.g. off Hawaii or New Zealand), and helicopter flights servicing oil and gas installations (which are projected to account for 25,000 to 55,000 flights per year in the northern Gulf of Mexico, centered on the Mississippi Delta area, a high-use area for sperm whales, particularly females and calves, and are likely equally significant in the North Sea and, increasingly, in the South Pacific and West Africa). The researchers stress the need for further study including, among other things, individual variability of sensitivity to noise (i.e., is a subset of the population likely to be consistently more "skittish" and therefore more impacted by repeated noise intrusions?) and the use of D-Tags to record received sound levels as well as more detailed behavioral response data (including call rates, dive patterns, respiration patterns) without relying on the noise intrusion itself as the observation platform, which limits the duration of observation and does not provide crucial information on behavior before, during, and after the noise intrusion. Moore, Howe, Stafford, Boyd. Including Whale Call Detection in Standard Ocean Measurements: Applications of Acoustic Seagliders. Marine Technology Society Journal. Winter 2007/2008, Vol 41, Number 4, p 53-57. Reports on a 2006 trial in which broadband (5Hz to 30kHz) recorders were installed on three Seagliders off Monterey Bay. Blue whale calls were detected on all but two of 76 dives, and humpbacks were detected on 20% of dives. Clicks and whistles similar to those made by dolphins and small whales were also detected, though not the focus of the study. As the researchers note, "The potential to include whale call detection in the suite of standard oceanographic measures is unprecedented and provides a foundation for mobile sampling strategies at scales that better match the vertical and horizontal movement of the whales themselves." Descriptions of some existing attempts to provide STRs focused on noise: In 2003, Brazil established a large buffer zone around a small existing MPA, to exclude the sounds of seismic survey airguns from entering the MPA (the buffer was withdrawn by a court due to jurisdictional issues; attempts are underway to re-establish it). In the Canary Islands, a 50 nautical mile buffer zone has been established around the islands, in which active sonar is not allowed (there have been some subsequent strandings that raise questions whether this is large enough a buffer). Recommendations for MPA managers, centered on a framework for making management decisions regarding possible noise-related STRs. Recommendation that noise-producers provide more information, and longer lead times prior to operations near MPAs, to allow for analysis of effects of proposed noise. A far-reaching element of this is a call for use of "detectability curves" to reflect how easy it is to find various species of whales, and to insure that more effort is made to find hard-to-detect whales, rather than assuming that they are not present if none are found using standard observational techniques. Recommended measures that could reduce the noise impacts of the primary noise producing activities. Suggested MPAs or proposed MPAs where noise-oriented STRs could be introduced, as case studies for future MPA managment protocols. These include the PELAGOS Sancturay in the northwestern Mediterranean, off France, Italy, and Monaco, the Alborian Sea/Strait of Gibraltar, the Bay of Bengal, and East Asian waters off Japan, China, and the Philippines. Kastelein, van der Heul, Verboom, Jennings, van der Veen, de Haan. Startle response of captive North Sea fish species to underwater tones between 0.1 and 64kHz. Marine Environmental Research 65 (2008) 369-377. This study exposed eight marine fish species to pure tones ranging from 100Hz to 64kHz. The tests took place in specially designed quiet tanks; species were chosen in part due to their economic importance to fisheries. Some species did not respond to the sound at all, even at the highest dB levels that could be produced, while others exhibited very clear startle responses to a relatively narrow range of frequencies (generally 100-700Hz), at received levels of about 100dB (re 1uPa, rms) for the lowest frequencies, with the startle threshold increasing to the range of 160dB as frequency increased to 700Hz. Only one species responded to higher frequencies than this: Horse mackeral responses extended up to 2kHz. The species that did not startle at all were Atlantic cod, Pollack, Common eel, and Atlantic herring. Horse mackeral startled to the widest range of frequencies, with Sea bass also quite responsive; Thicklip mullet and Pout both startled to a narrower range of frequencies. Interestingly, for fish that have established audiograms, it appears that the startle response does not begin until the noise is 10-30dB above the hearing threshold; and, again, some fish showed no startle even at levels up to 45dB above their presumed hearing threshold. The researchers note that these results on captive fish to pure tones can not be reliably extraploated to wild fish in varied contexts or to more complicated sounds, but suggest that the extreme variability seen here is an important consideration in more natural situations as well. They suggest futher study using "sounds more similar to anthropogenic noise, to more complicated sounds, such as sweeps, and to the actual broad-band noise of, for instance, wind turbines and shipping..."
Pingers are used in large fishing nets, to alert dolphins so they avoid entanglement and drowning. This study found that some pinger signals seem to affect he behavior of Sea bass, mullet, and herring (increased swimming speeds and/or movement toward or away from surface). The researchers note that "Pingers developed to reduce odontocete bycatch should not deter the fisheries’ target species from the gillnets, and should not deter target or non-target fish from ecologically important areas such as feeding and breeding grounds, or mask their communication sounds"
Recent efforts to increase the accuracy of fish population surveys by employing specially-designed quiet research vessels that would not scare fish away with their approach were confounded by a study that indicated that a new quiet vessel actually scared the fish more easily. The commenters in this letter to the editor suggest that this may be due to the sensitivity of many fish species to pressure waves (or, "infrasonic particle acceleration") created by ship hulls. Thus design of research vessels may need to look beyond noise emission, and consider hull shapes. The vessel that was quiet yet disruptive had a large displacement volume; the commenters here suggest that minimal water displacement, such as hovercraft or foil type vessels may reduce the disruptive particle acceleration. Kastelein, Verboom, Jennings, de Haan. Behavioral avoidance threshold level of a harbor porpoise (Phocoena phocoena) for a continuous 50kHz pure tone. JASA, 123(4), 1858-1861. R.A. Kastelein, etal. The influence of 70 and 120kHz tonal signals on the behavior of harbor porpoises (Phecoena phocoena) in a floating pen. Marine Environmental Research 66 (2008), 319326. Recodings made during construction of a man-made island, 5km offshore in 12km of water, reveal that the noises of ice-augering, pumping, backhoe trenching the seafloor, and pile driving can be heard for several kilomters underwater. Sound measurements were made above the ice (in-air) and underwater; vibrations in the ice were also measured. Airborne sounds disipated to background ambient levels at less than 3km, while underwater sound reached median background levels at just over 7km, and in-ice vibrations reached natural levels by 10km. This very interesting paper, digging deeper into a topic that had emerged in previous studies of toothed whale hearing, reveals that a pilot whale could apparently "turn up" its hearing sensitivity, so that it could listen for fainter (more distant) sounds when echolocation clicks did not reveal nearby echoes. The research used a captive whale, outfitted with suction-mounted EEG electrodes to measure evoked potentials as it echolocated; half the time, a target fish was nearby, and half the time there was no nearby fish. When no fish was present, hearing sensitivity was 20dB higher (ie it could hear sounds 20dB more faint). During August and September, 2007, the first controlled exposure experiments aimed at learning more about the ways that beaked and pilot whales respond to exposure to mid-frequency active sonar took place in the Bahamas. For the past decade or more, much emphasis has been placed on discovering what sound levels cause TTS (temporary threshold shifts, or short-term hearing impairment), with the thought that these levels could serve as a benchmark of exposure levels that we should be concerned about; however, it appears that in some cases, beaked whales that ended up stranding were exposed to much lower sound levels. Hence, the need to learn more about how they change their dive patterns and other behaviors in response to moderate sound exposure. D-tags, which have been successfully used in studies of sperm whales for several years, provide an opportunity to safely measure received sound levels and dive patterns simultaneously. The tags are applied with a long pole when the whales are at the surface, remain attached via suction cups, and fall off within 10 or 15 hours. The researchers noted that, in the absence of a clear sense of when and why some beaked whales are affected to such a strong degree that they beach and die, the result has been a highly precautionary and sometimes arbitrary approaches to management of sound, leading to debates between interested parties that have at times been difficult and ultimately unproductive. In planning for these experiments, the researchers worked with a wide range of parties, including environmental NGOs; while some NGOs had strong reservations about controlled exposure studies, the researchers note that "a constructive spirit of dialogue contributed to the success of the study." Goals of this study: to establish protocols for tagging and careful controlled exposures, to discern exposure parameters that cause a behavioral response (change in behavior), and to compare any responses to sonar signals and orca sounds, to begin to explore whether they respond to sonar as a possible predator. Ten animals were successfully tagged; 6 Blainsvilles beaked whales and 4 pilot whales. Seven provided control/baseline measurements, and 3 tagged animals were exposed to playbacks of MFA and/or orca sounds (1 beaked, 2 pilot). The researchers provide rather detailed descriptions of the responses of the one beaked whale that was tagged during controlled exposure; of course, with only one sample, and few controls, all results are very tentative. Walter, M.X. Simmer, Peter L. Tyack. Repetitive shallow dives pose decompression risk in deep-diving beaked whales. Marine Mammal Science, Volume 23 Issue 4 Page 888-925, October 2007. It is apparent that beaked whales are especially sensitive to mid-frequency sonar, but the reasons have remained elusive. This study explores a new idea about how the whales' dive patterns may be disrupted enough to cause decompression sickness (DCS, ie "the bends"). Some have suspected that exposure to sonar may cause the whales to surface more quickly than usual, but since the whales' lungs are collapsed in dives deeper than 70m (thus preventing nitrogen from entering the bloodstream and infiltrating into tissues where it could cause damage), it is not readily apparent how faster surfacing would cause DCS. Instead, this study looks at the "recovery" period observed in beaked whales, during which they make a series of near-surface dives before embarking on a new deep foraging dive. The researchers modeled the possible physiological effects of having this recovery period extended longer than usual. The team incorporated known physiological data into a model that charts how the bubble size might increase in the circulatory system, brain, muscles, and fat tissues when a whale dives repeatedly to between 30 and 80 meters for as long as 3 hours. The team's model predicts that if the whales' lungs do not collapse during a long series of shallow dives, the increased pressure can cause nitrogen bubbles to diffuse into tissues, increasing the risk of bubble formation on ascent. Such behavior may result if the whales perceive sonar transmissions as a predator: repeated dives travelling horizontally to escape the percieved predator could put the animals at risk. When fleeing an orca (their primary predator), such avoidance would like be short duration, and not dangerous; however, if the sonar transmissions continued to be audible for long periods of time, the whales might continue the avoidance dives to the point where they begin to sustain injury. This could also explain the relatively unusual appearance of beaked whales close enought to shore to end up beaching: they might be chased far from their normal habitat by continuing sonar sounds (ed. note: it also begs the question of whether many other animals are similarly injured, but happened to be fleeing in other directions). The team concludes that limiting the duration of sonar testing may prevent the animals from diving in these harmful patterns. This detailed report examines 44 dive sequences by 10 individual beaked whales. Deep foraging dives, during which the whales attempt to eat about 30 prey fish, last 45 minutes to an hour; between deep dives, they perform a series of dives closer to the surface. It appears that the surface dives become progressively shallower over the course of the hour to hour and a half spent between deep dives. The authors examine several proposed changes in dive behavior or possible physiological responses to observed dive patterns, and conclude that the evidence does not clearly support most of the proposals, noting that "aspects of the diving behavior of beaked whales remain enigmatic." They propose the theory explored in the physiological modeling paper above: that extending or altering the near-surface dive behavior could place the animals at risk for decompression sickness, triggering gas and fat embolic syndrome and stranding deaths. Popper, Halvorsen, Kane, Miller, Smith, Song, Stein, Wysocki. The effects of high-intensity, low-frequency active sonar on rainbow trout. J. Acoust. Soc. Am. 122 1 , July 2007. p. 623-635. This study extended a previous line of research that had measured physiological impacts of seismic survey air guns on fish kept confined in a cage and exposed to the noise. This time, the research team exposed trout (which share hearing mechanisms with salmon, which are of special concern due to their endangered status) to sounds produced by low-frequency active sonar. LFA sonar uses frequencies (100-500Hz) that many fish can detect, often the range of most sensitive hearing. Fish were tested for hearing sensitivity using Auditory Brainstem Response (ABR), and some were sacrificed to check for physiological damage, including swim bladder or ear hair damage. Results indicate that fish had reduced hearing sensitivity after exposure to LFA sonar, ranging from 17-25dB at particular frequencies (i.e., sounds needed to be that much louder in order to be heard), and that the effects lasted at least 48 hours (the longest followup the study included). However, the researchers note that there was quite a lot of variability in results, with some study groups showing little shift in hearing thresholds even with longer exposure to the LFA sounds, and some frequencies of hearing being little affected; also, the fish, being captive in a cage, were exposed to constant high sound levels that are unlikely in the wild, making this a probable worst-case scenario (the levels these fish were exposed to would occur only within 100m of the sonar transmission, which would be on a moving vessel). Unlike some earlier pile-driving and explosives studies, the fish exposed to LFA sounds did not show any acute tissue or organ damage. And, unlike earlier airgun studies, there was no apparent damage to ear hair cells; such injury would likely cause a permanent reduction in hearing sensitivity. The fish did respond to the onset of the sound with a rapid burst of swimming; this will be examined in another paper. Haviland-Howell, Frankel, Powel, Bocconcelli, Herman, Sayigh. Recreational boating traffic: A chronic source of anthropogenic noise in Wilmington, North Carolina Intracoastal Waterway. J. Acoust. Soc. Am. 122 (1), July 2007, p.151-160. This study analyzed recordings of ocean noise during the summer season (June 21-September 1) in a 100m-wide intracoastal waterway off North Carolina. The mean received sound levels (measured as RMS re 1uPa, at frequencies averaged in steps over 0-37.5kHz) ranged from 109dB at 6am to 118dB in early afternoon and back down to 111dB by 10pm. Not surprisingly, weekends and holidays were 1-3dB louder than weekdays. The frequency spectrum shows that low frequencies (below 1kHz) dominate, with significant energy remaining up to 5kHz, and lesser but still perceptible noise up to the 37.5kHz limit of the study. Dolphin observations showed a clear reduction in numbers of dolphins observed on weekends and holidays, relative to weekdays; less than half as many dolphins were observed on weekends. Noise levels in the range of 5-25kHz, the primary range of dolphin social whistles, was of particular concern. The researchers note that "mean hourly RLs exceeded 116 dB nearly every day surveyed, indicating bottlenose dolphins in the ICW near Wilmington, North Carolina could be at risk for noise exposure on a daily basis. High mean RLs were often recorded over consecutive hours, making high sound levels the rule in this area during the summer, not the exception." Further, they note that since bottlenose dolphins feed mainly on soniferous fishes (fish that make noise), and that fish vocalizations are primarily below 1kHz, the range most dominated by boat sounds, dolphins may well find it more difficult to hear and find prey. Marine mammals are notoriously hard to count, since they spend so much of their time underwater. Scientists, policy makers, and industrial and military planners all need to have accurate assessment of populations and population trends. However, many populations are not surveyed often enough or comprehensively enough to really know how many animals there are. Using statistical analysis, the researchers looked at a hypothetical situation in which populations were declining 50% over a 15 year period (the rate at which a stock can be legally classified as "depleted"). The percentage of precipitous declines that would not be detected as declines by current survey techniques and frequency was 72% for large whales, 90% for beaked whales, and 78% for dolphins/porpoises, 5% for pinnipeds on land, 100% for pinnipeds on ice, and 55% for polar bears/sea otters (based on a one-tailed t-test, ? = 0.05; this number measures the statistical significance of the results, or in lay terms, how confident we can be in the results--more on this key factor below). "Fundamentally, we cannot reliably detect even precipitous declines in most whale, dolphin, porpoise, and ice-hauling pinniped populations with present levels of investment in surveys and current survey technology and design," the researchers stressed. They recommended several alternatives to improve performance, including (to list a few) more diligent focus on indicator species, increase in survey frequency, and most fundamentally, a change in the "decision criteria." This last suggestion involves a shift in the balance of risk between over-protection and under-protection: the current standard of statistical significance of ? = 0.05 means that we will over-protect (perceive a decline where none actually exists) only 5% of the time; meanwhile, this standard, as suggested by the results above, leads us to MISS a decline up to 50-90% of the time. Softening our standard of significance to ? = 0.2 would detect a decline 80% of the time that one existed, while also over-protect 20% of the time (equal over and under). They also suggested possible changes to the math used in analyzing trends, development of better models, and designing surveys to more specifically detect trends than absolute abundance (though noted the drawback that, especially during declines, it is common for distributional shifts to occur. In many cases, for animals that range widely, repeated survey cannot be sure that they are observing the same animals/population; thus, researchers suggest that changing the decision criterion is a "more reliable" solution. Changes in Cetacean Abundance During Seismic Surveys in Brazil: Possible Long-term Monitoring Approach? In this study, Brazilian researchers analyzed existing data on cetacean abundance (as monitored by the Brazilian government and reported to the IWC, and as monitored by seismic survey vessels), on seismic surveys (from Brazilian oil and gas agencies), and on oceanographic parameters; the period analyzed was from 1999 to 2004. The results suggest a decrease in the diversity of species in the face of an increase in the number of seismic surveys during the years 2000 and 2001, even though there was no significant change in oceanographic patterns in this period, and that a relationship exists between diversity of cetaceans and intensity of seismic surveys between 1999 and 2004. Most of the differences in diversity were caused by fewer dolphin species being observed. While more detailed and ongoing data collection (including more species and a broader array of other possible causes for changes in species diversity) will be needed to evaluate this seeming connection, the results suggest that species diversity may be a useful indicator of the long-term impacts of seismic surveys on cetaceans.